We headed down the West to the Aran Islands. We had no idea where we were going until we arrived at the ferry port. We even thought we were getting the plane over at one stage. I felt like I was in a scene from the Titanic as we were filming the boat scenes. The island was amazing. Such scenery! Damian Dempsey was even playing there that night, but we had to be up early so no pints for us!! It reminded me of what Ireland was like 20 years ago. When we checked into the B&B, we asked for a key for the front door. “Sure the door will be open”, came the response. We also saw currach racing in the sea which was not for the faint hearted. The sea foraging with Enda from www.southaran.com was very interesting. I loved the seaweed but I’ll pass on the limpets. Felt like chewing 5 day old chewing gum. The rocks were very slippery and Enda kept telling us to mind our step. Unfortunately for him, he fell in up to his knees, but they didn’t catch it on camera. The carrageen pudding was divine and yet so simple. It’s supposed to be very good for you particularly in winter, so myself and my daughter are topping up on it. 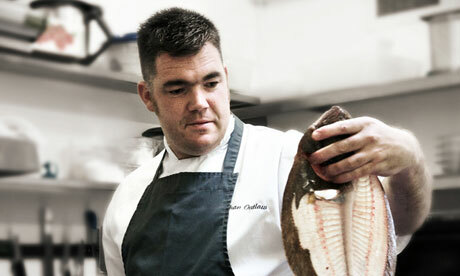 Back to the kitchen where Nathan Outlaw and a 7 kilo salmon awaited! That was tough and I was picking scales out of my clothes for days. Nathan was such a nice guy and really helpful. A real pro. It was such a beautiful fish, I was afraid to mess this one up, but I really enjoyed this task especially after a few dodgy weeks. The dish was amazing but I can’t believe I over seasoned it. I’m normally a divil for under-seasoning and Dylan has pulled me up a few times on it. Not nice for Sinead to go out at this stage. She is such a nice person and a good friend now. It is down to the smallest of things at this stage. Next week will see the Michelin starred chefs coming in to critique our dishes.